From Foothills to Fog: Winter Travel Guide to Whistler B.C. 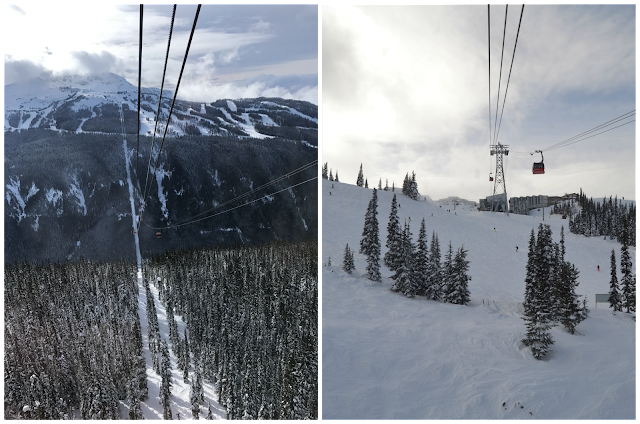 Back in February, we spent a long weekend with our close friends in Whistler. It was such an amazing trip, we all really fell in love with Canada and the beautiful scenery of Whistler. Andrew is passionate about snowboarding and all winter activities (all activities in general). In the winter months, he and his friend Corrie are snowboarding at least once a week together. Luckily, Corrie's wife Erica is one of my oldest and dearest friends! 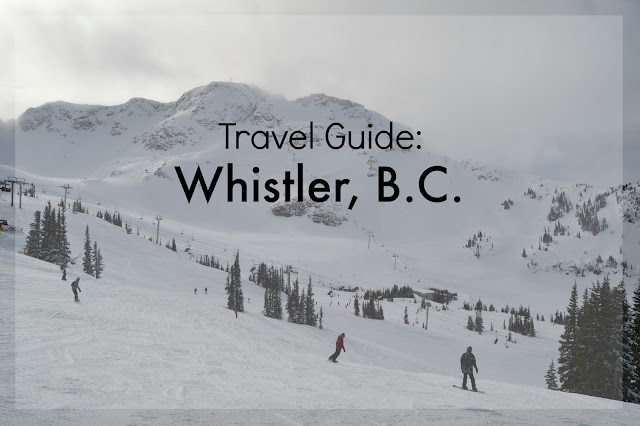 Since the boys' Epic Tahoe pass also works for Whistler Backcomb and Whistler Mountain, we thought it would be fun to take advantage and plan a long weekend. We picked a random weekend in February, hoping for the best with snow conditions, and lucked out to arrive in a winter wonderland. 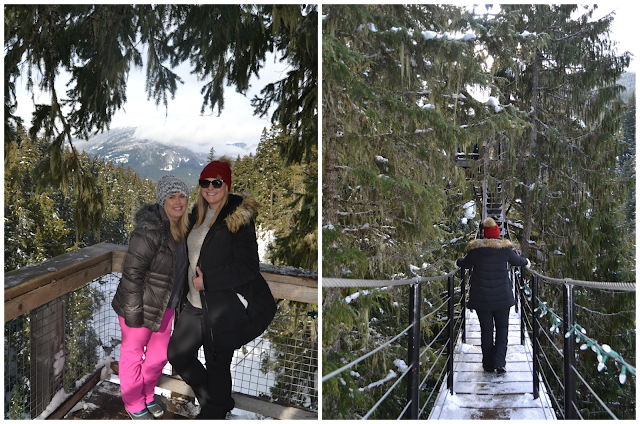 Since Erica and I are not big into skiing or snowboarding, we found some pretty perfect ways to fill our days while the boys were on the mountain. Because our trip was so wonderful, I knew I had to create a guide for the blog. Whistler is full of wonderful activities for those who love snow sports, as well as those who are a bit less adventurous. It would also be a great family vacation spot, with so many kid friendly activities. We rented an AirBnB for our stay in Whistler, which was perfect. Our main criteria was to be walking distance from the village. Erica and I didn't want to worry about driving in case the weather conditions were really bad. And the boys wanted to easily walk with their gear to the gondola. We found this two bedroom condo that was perfect for the four of us. The only thing that would have made it better is having a queen bed in both rooms, but we drew straws and our friends ended up pushing the beds together. The best part about the condo was the location, and it had a private hot tub on the deck. Ideal after a long day on the slopes, or watching the snowfall with a glass of wine in the evening. It was truly wonderful, I would highly recommend our condo, or one in that complex. It's especially nice to have a kitchen so the boys could pack lunches to eat on the mountain, the cafes at the top get so packed and are a little pricey. Our only complaint about this condo is that it was across from a large parking lot, and every morning we were woken up by a snow plow. But even still, we were really happy with where we stayed. I'm sure if you book in advance, you'll find many wonderful AirBnB locations. There are also many hotels in the village if you prefer to have hotel amenities. 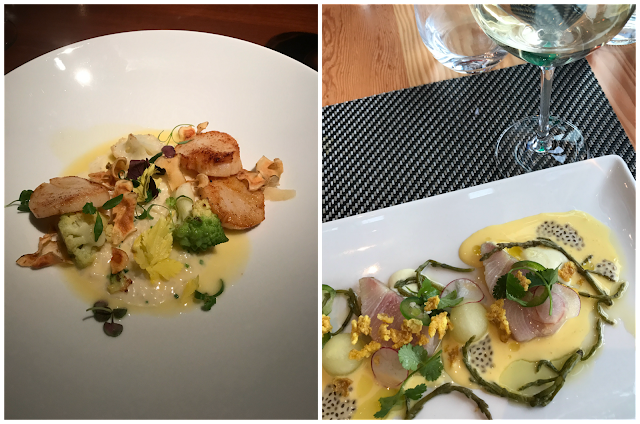 I'm not sure why I was a bit surprised by this, but Whistler has amazing food. We went to a few really nice restaurants, but also a few that were more casual and still delicious. There are many choices in the village and nearby. We were also really impressed with the service everywhere we ate. Maybe it's just because Canadians are so nice, although most of our servers were expats, but they were happy to split the check for groups, and accommodate any dietary needs. I've included a few of our favorite places for you here. I would also recommend making a reservation in advance, because without one the wait times can be long. The Mexican Corner Restaurant - this is a great spot for a casual dinner, as the name suggests, it is right at the gondola for Blackcomb. We went for dinner one evening and watched the Fire & Ice show. It was actually a perfect spot to watch, which we discovered by accident. Sushi Village - We didn't go here but our friends had suggested it, saying it has a fun atmosphere with great food. A few places we went that were a bit pricey, but great for a special occasion or if you love a good meal while traveling. Bearfoot Bistro - This was a great restaurant if you're looking for a fine dining experience. If you buy a bottle of champagne you can go down into the cellar and learn to open it with a saber, which is always fun! There is also an attached Vodka Ice Room that you can go in after your meal, before dessert. Although a fee does apply. Although we didn't realize how pricey this meal would be, it was well worth it because we all loved our meals. Araxi Restaurant - another great restaurant that is also nice, it's the sister restaurant to Bar Oso. We had an amazing meal here, with excellent service. 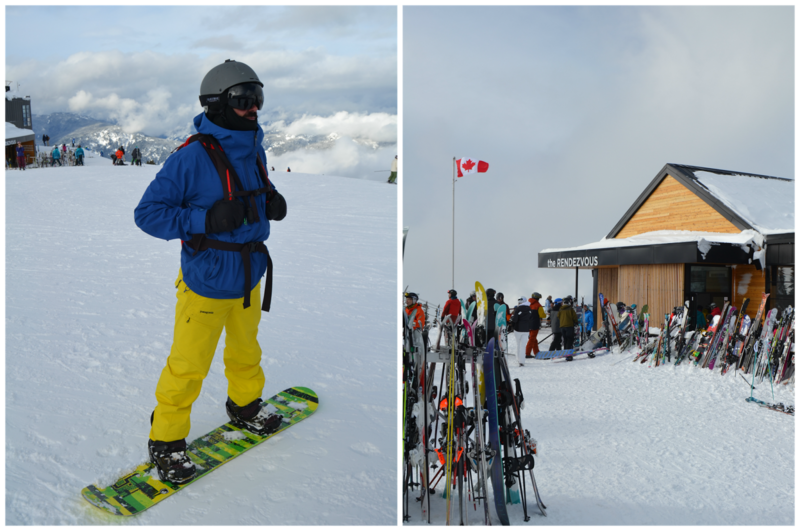 Christines on Blackcomb - This is a fun spot for drinks and lunch on the mountain. Again, it is a bit pricey, but you're paying for the view and experience at the top of the mountain. Note, it closes at 2pm and can have long wait times. While the boys were on the mountain, Erica and I made sure to try a few spots for brunch. 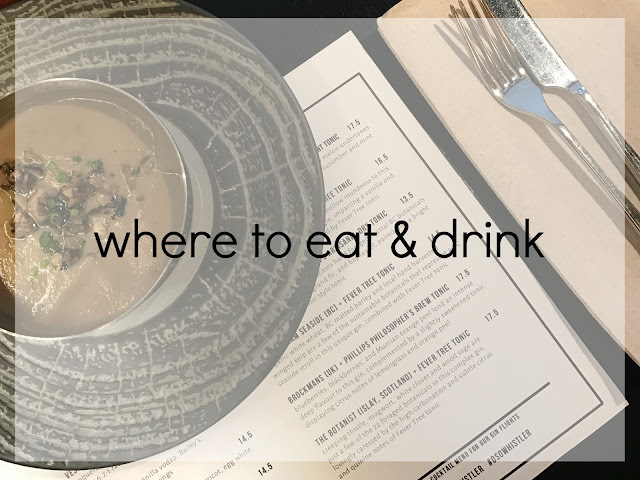 Although I think they could up their brunch game in Whistler Village, we found a few great spots. I think most people have a small breakfast at their condo or hotel before heading up to hit the slopes. So it makes sense there aren't as many places for breakfast. 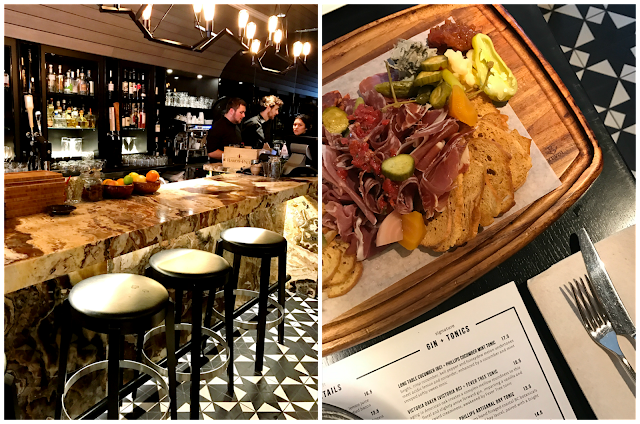 Basalt Wine & Salumeria - This was our second brunch out and I think our favorite. The eggs benedict was amazing, and the service was great too. Stonesedge Whistler - This was a classic brunch spot with really cute decor. 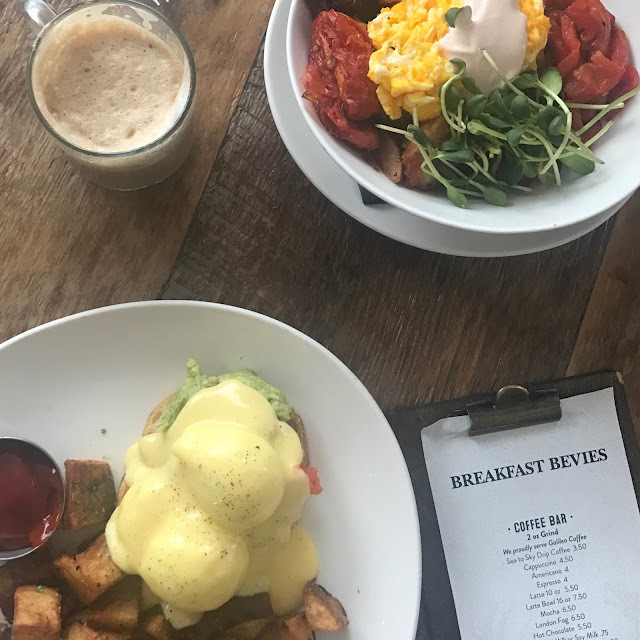 They had a few really delicious breakfast bowls that we loved, and of course the classic eggs benedict. One of my favorite activities was the morning spent at Scandiave Spa. It's just outside of town and easy to get to by car or taxi. I'm sure if you stay at a hotel, the shuttle would probably drive you as well. It was truly the most relaxing, idillic setting. I'm sure it's beautiful year round, but something about the steaming pools amongst the snow was so beautiful. We booked an hour massage to start our time day, then spent a few hours afterwards enjoying the various pools, sauna and steam rooms. We both had wonderful massage therapists, it was one of the best massages I have had in a long time. She really listened to my feedback and was aware of my preferred pressure and focused on areas (neck & shoulders) where I tend to carry stress. After our massage we went down to the locker rooms to change and venture out into the pools. They recommend 10-15 minutes hot, followed by 20-30 seconds cold, and then 15 minutes in a neutral temperature. There are various pools with different temperatures, as well as dry saunas and steam rooms, and spaces indoors for relaxing by the fire. We made the most of our time there and tried everything. My favorite was the warm pools and dry sauna. I also like the steam room, but it was a little warm for me to stay longer than 10 minutes. The cold plunge was quite shocking, but always felt great afterwards. After a couple hours, we showered and got ready before heading upstairs to enjoy a coffee by the fire and enjoy the view. I would definitely recommend booking a massage or spa treatment, then allowing at least two hours to enjoy the rest of the amenities. Another highlight was our time dog sledding. We arranged for a sledding tour that was about an hour drive from the village, but they included transportation. We loved the company because they use a lot of rescue dogs and help rehabilitate them from abuse or neglect. You can tell the dogs are so well loved and taken care of, plus they have so much fun working! 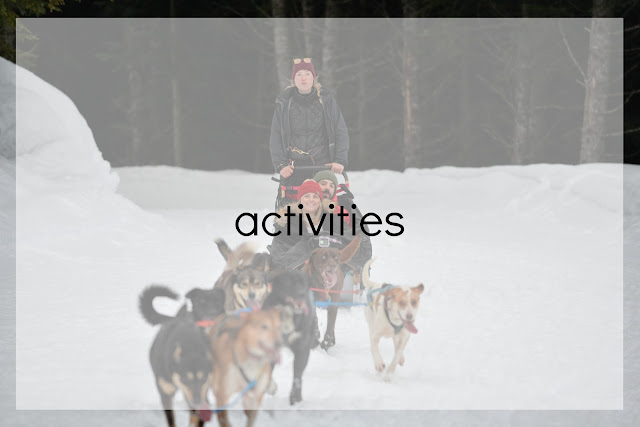 The tour itself was about an hour, and we learned more about the process and training the dogs, but we were also able to mush (aka drive) the sled. It was such a fun experience and we just loved all the pups! 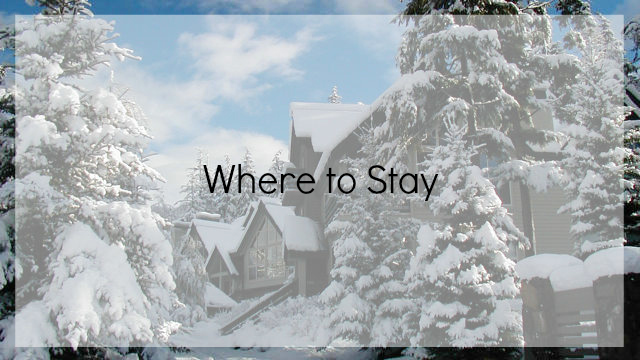 I would definitely recommend this if you travel to Whistler in the winter months, especially if you're a dog lover! I think this activity would be great for families with children too. 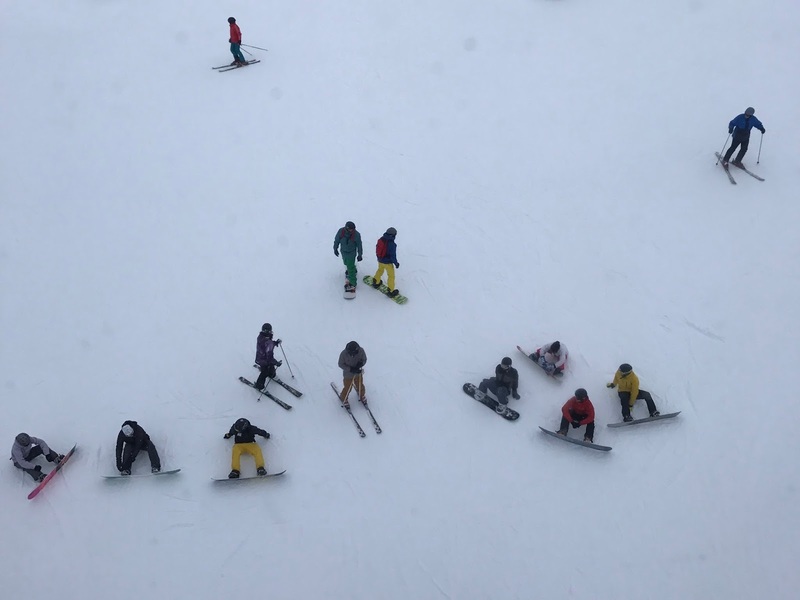 Since my friend and I weren't snowboarding with the boys, we wanted to find a few other activities that we could enjoy. We looked into snow shoeing, but couldn't find an affordable tour we were interested in. But we did find a canopy hike that followed the zip line course with a guide that shared information about the forest and wildlife in the area. We were both surprised by how much we enjoyed this tour. It was really affordable at only $49 a person with a coupon from our AirBnb, and that also included a ticket for the peak to peak gondola, which is about the same cost by itself. It was so fun learning more about the ecology of the area, crossing the suspension bridges, and even having people on the zipline tour fly over head sometimes. In Whistler Village there are a number of shops. We spent one afternoon exploring the village after brunch and browsing the various stores. Many of them are definitely tourist spots selling souvenirs, but there are a lot of outdoor gear stores and cute boutiques. After our Zip Trek Tour, we went up the mountain to do the Peak to Peak Gondola. The gondola connects Whistler Mountain and Backcomb, and is the longest suspension gondola in the world! I was actually kind of nervous, but once we were on it I felt totally fine. We even waited for the glass bottom gondola to get more of a dramatic view! Once we were over to Blackcomb, we met up with the boys for lunch and cocktails at Christine's on Blackcomb. 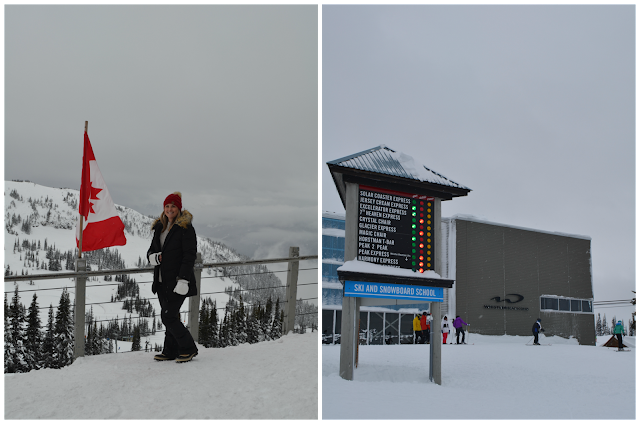 Of course, the main reason to go to Whistler is for the snow sports. Andrew and Corrie raved about the snowboarding. They could have spent another week exploring the different terrain. They are used to going to parks they have been riding for years, so they felt like there was so much to explore and they were on the hunt for the best runs. Andrew said next time, he wants to do a guided tour so they can do a little back country snowboarding and get to know the best spots on the mountain that locals like. The great thing about Whistler is there is something for all levels, and great options for lessons too! 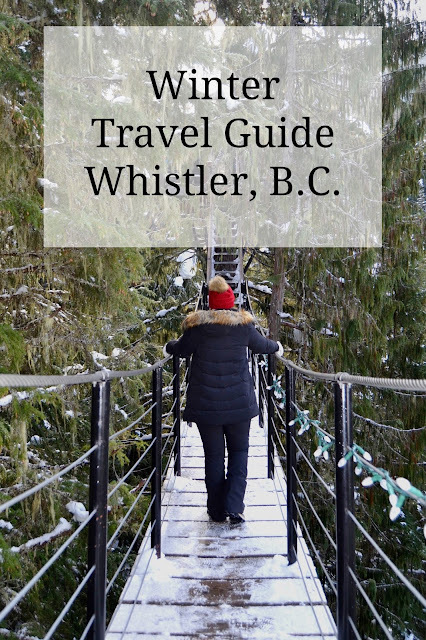 Have you been to Whistler? If so, I'd love to hear any suggestions for fun activities I might have missed. Andrew is already talking about another trip, so I know we'll be back. Perhaps my next Whistler Guide will be for summer! I hope you enjoyed this travel guide. I know it's a bit late and everyone is in spring and summer mode now, but be sure to pin this to save for planning your next winter vacation.